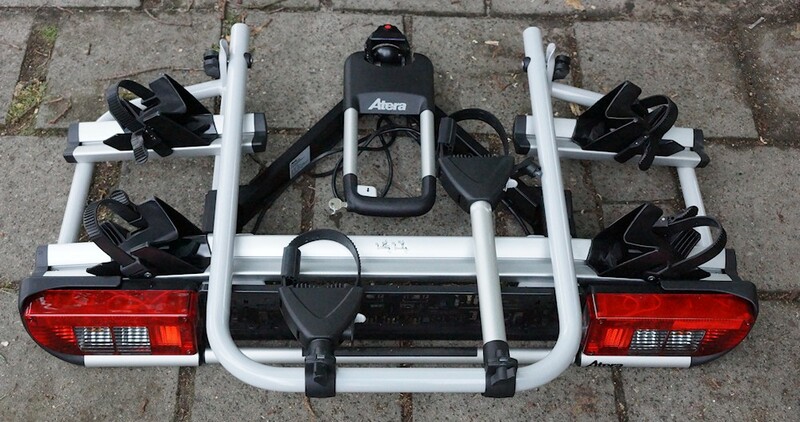 tested The Atera Strada E-Bike M and we provide in this article a bicycle carrier which was made especially for the transport of electric bikes, so bike with a little more weight. We look at the handling of the assembly and all important functions from Atera Strada E-Bike M.
the bike carrier was delivered in a conventional pack carton from a normal package service, up to the front door. The box was well packed, closed and glued. The bicycle carrier itself was still protected with an additional box in a box. The light bar / bridge was twice as boards during transport. In addition to the bike rack were still a manual and a booklet with «important instructions for use», with at. That’s it already. This point belongs to every report, even if it fails a little shorter in this bicycle carrier. The bicycle carrier came fully assembled us supplied. Only a cable tie we had to cut through, this has held together the carrier for transport. Otherwise the Atera Strada E-Bike M can be assembled without tools and out of the box on the car. This is a big plus since even laymen can use the carrier without much delay. Thus one ever gets its bicycles to the carrier, it must be attached to the trailer coupling first.You take to the bicycle rack and pulling the lever assembly before all, so this is ° angle to the carrier about the 90th To this end, the small gray button on the handle has to be pushed in.Now about 20 ° pull and place the bike carrier on the towbar. Now the handle again just ask and make sure that the control pin as far out looks that this makes visible under the red mark the green marker. Caution: If this flag is not visible, the bike rack mounted incorrectly. The mounting handle now down (away from the car and right road) press. The carrier begins solid to sit on the ball of towing devices. Press the lever as far down until the Atera Strada E-Bike M Bike carrier is stuck and can not move on the ball of towing devices. Completing the bicycle rack or the button with the lock to protect them from theft. Place the bracket and secure it with the quick release coupling on both sides; almost finished. After the Strada E-Bike M has its proper place found, nor the power plug must be plugged.Depending on the car connector, an adapter must be used here may. Newer car models should all have a matching socket. The plug fits only once in the bush and is rotated for fixing 90 degrees. After connecting all the functions of the lighting bridge should be examined.Brake, tail light, reversing light, turn signals and even a rear fog lamp are available here. Align the black tire stopper so that, you can put the big bow in fold down between the stoppers. This saves space when stowing, the carrier is again not used. Ensure even find that both front and rear tires in the shell space and the bike almost equidistant survives on both sides. The stopper can be performed with a cap screw and move on the shell, provided that you always transport the same bikes, you do not need to adjust this setting, once found, again. The heavy bike should always be first placed and mounted on the bicycle carrier. Here it is important that you let the longer support arm upwards showing skyward. Now set the first bike on the bike carrier Atera and fix it. Turn the second holder arm now ready to be up this parallel is the first. Now place the second bicycle to the rack. Once you have aligned the stoppers and fixtures in the tire tray and the bicycle on the Atera Strada E-Bike M position, pull the plastic tabs through the rim and run them on the car-side remote from the flap side. Here comes a ratchet mechanism used. Press the tab as far pure until it no longer works, for the Last time you use the ratchet and position it then upwards.This is done on all three breakpoints. Front, rear and frame bar. The bicycle is now mounted on the carrier after Proper application. So you can not be stolen by unauthorized e-bike, the frame holder is lockable. Important: Check before each ride, always check the locks are closed and you have the key with him. Also, the frame lock on the bike you should complete, and «loose» parts such asbicycle bags , hinged Fahrradkörbe remove, water bottles, and especially the e-bike battery and transport irish car. Thus one still comes with turbocharged bikes on the trunk, can the bike rack mounted on the trailer coupling, fold down. Therefore one must push the «Pull» button and loosen the foot release. 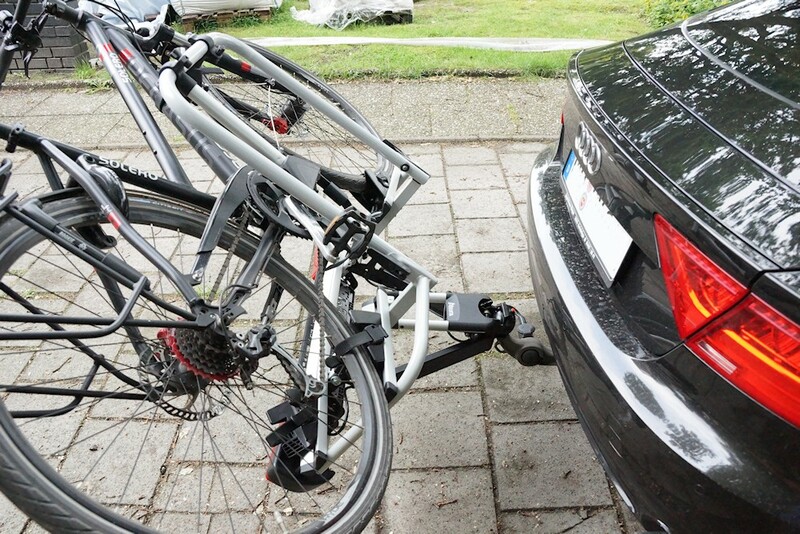 The bicycle carrier will now fold away from the car and the trunk lid can be opened. 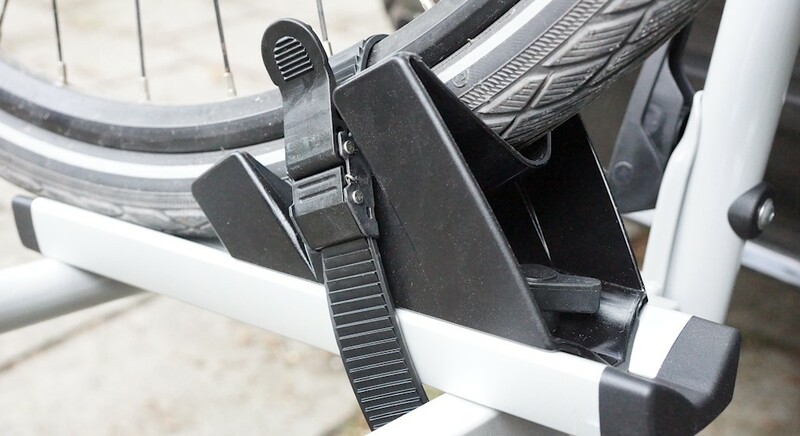 Access to fold down the bicycle carrier with both hands on the rear bike and hold it firmly.Heavy Bicycles have a not inconsiderable royal weight, when folded down, you should slow and controlled pull the carrier to be. The bicycle carrier of the car is allowed to drive only a maximum speed of 130 km / h. With a width of 100 cm and a height of 27 cm to the bicycle rack may well call compactly folded. The Strada E-Bike M is very compact and small, the tool-less installation it is fast assembled and dismantled. When folded, it fits (without bicycles) in a normal boot and can be easily transported. 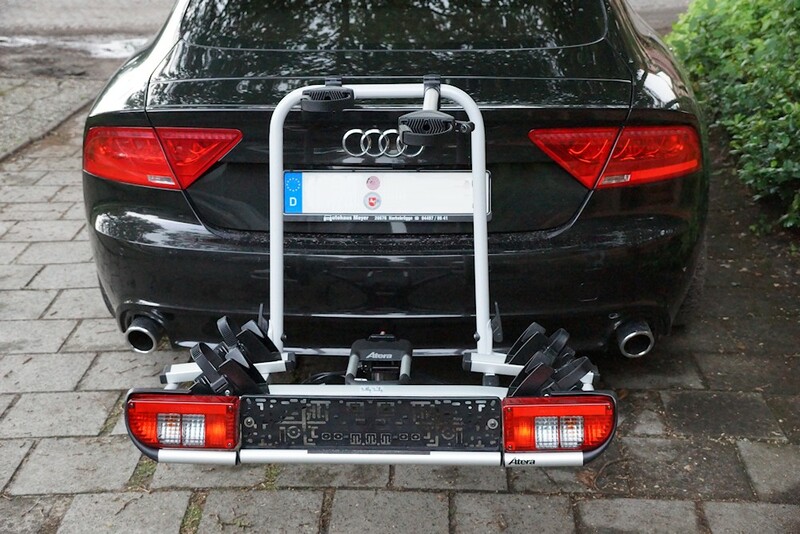 The bike carrier is easy to mount on the towbar and quite easily. The Adjustable fixed points in the tire tray ensure optimum position from the bicycle, with 30 kg load per tray can e-bikes are well conveyed. The processing from the Strada E-Bike M makes a good, solid and overall high-quality impression. Fittings are designed and can be attached and removed easily. Whenever parts from bicycle carrier touching the bike, working with a rubber. Thus the paint and the bike from damage are protected. The support is for max. 2 E bikes are allowed, but he may order a 3rd bicycle (no e-bike) are supplemented. Here it is possible to retrofit an extension rail. must be noted, of course, the maximum load and vertical load. From us the Atera Strada E-Bike M gets a Very Good and reached 4.5 of 5 points. Other models can be found in the bike carrier test and you should still be looking for an e-bike, you will find information on buying in the article E-Bike Test .